Flames had spread from the engine of this old pickup to the truck bed by the time firefighters arrived on the Highway 36 bypass road in front of Nakoon Resort. No one was hurt. An old pickup truck was destroyed by fire in Nong Plalai. Flames had spread from the engine to the truck bed by the time firefighters arrived on the Highway 36 bypass road in front of Nakoon Resort Feb. 28. It took about 10 minutes to extinguish the fire. No one was hurt. 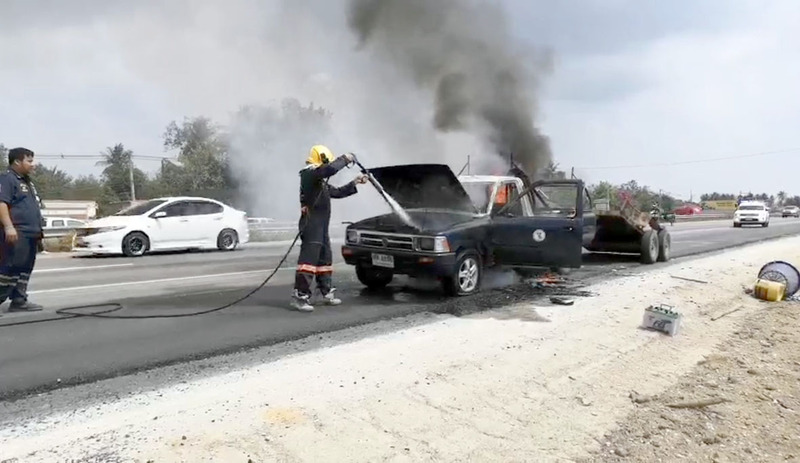 Driver Boonsong Eimchukul, 53, said he was hauling a backhoe in a trailer from Banglamung when smoke began pouring from under the hood. He pulled over and thought about unplugging the battery, but it was too late. He pulled the backhoe out of the burning truck and waited for help.